I hope to be able to bring you a blog soon on Identity, sharing stories from several other Indigenous individuals about their experiences in forming their identity in our post-colonial world. If you are interested in being a part of our first collaborative blog, you can send me a paragraph to be included and we will gift you with a bathbomb or medicine gift. I am not going to put a timeline on this, and if you happen to want to submit after the initial post is published, please feel free to connect as we can always do a follow-up post to the original. Has your heritage played a role in your identity formation? What role has Canadian society played in your identity formation as an Indigenous Youth or Individual? Anything else you want to share about your story as a Self-Identifying Indigenous person? We will also now be utilizing the site for more Art posts and updates, as well as sharing some older photos – did you know that we have been dabbling in photography for about 15 years now? We started with an old wind-up film camera at about 10 years old; we have always been interested in photography, but we never did anything with our photos. This has resulted in a ton of random photos LOL; we have decided to start to share them in the form of photo journals, which we will be posting here on the site. We have been blessed to be able to travel quite a bit in 2018 and have some great shots we want to start sharing of Kanata. We also want to share some older shots to show our progression as a photographer. Our first photo journal will be posted prior to our collaborative identity post and will be our self as the subject, with photos taken by us and others. This photo series is one of the steps I am taking to rectify the relationship to my own body and vessel as an Indigenous Woman, as there have been times when I have felt disconnected to myself and was very, very unkind to myself. Oki Tansi my dear readers! How long has it been since I last updated? TOO LONG! A lot has happened since then; I moved to BC, but I am back in Alberta again now after things didn’t quite work out as planned. Such is life, and all I can do is keep moving forward. I had intended to keep my business in BC, with links to Alberta (given that my extended family is still located here). However, after unexpectedly moving back from BC due to several reasons, I have made the decision to relocate the blog business back to Alberta again for the time being – this doesn’t mean I won’t be back in BC though! I am hoping to continue doing work across the country through my blogging and vlogging, bringing you dear readers new exciting content. For now, I am focusing on doing work in my own home community of Kainai (Blood Tribe), as I re-group from the move and plan out 2019. If you have been following us on Facebook, Instagram, Twitter or YouTube, you will know that we have decided to take the blog in a new direction in 2018 and into the future. You may have also noticed that we have a brand-new look to our website + a new domain name + Shop, which incorporates our social media channels; how cool is that? Let us know what you think of our new look by leaving a comment on our social media channels, or below. Our new direction for the blog is less focused on just showcasing entrepreneurs, due to the time it takes to create those blogs, and is now more focused on WELLNESS through ART, ENTREPRENEURISM, and FINANCIAL LITERACY. Why this change in direction, you might be asking…? In addition to keeping busy working full-time these past 2-3 years, we have also been actively attempting to network with entrepreneurs and have been attending many a-conferences in between. What we noticed after working in the financial industry for approximately 5 years, is that there is a need for Financial Literacy in our Indigenous communities, and many of you have questions about taxes, credit, and investing. While we are by no means an expert, we have been blessed to be able to gain an understanding of these topics through our formal education, as well as through direct experience working with Indigenous communities, entrepreneurs and artists through our travels. We have begun to be able to apply such concepts to the Indigenous Market, and actively use these concepts in our own financial planning and tax planning and want to share that knowledge with others. We also want to create more community among our readers and have been looking at new ways to drive traffic to our blog site, while helping other entrepreneurs and artists at the same time. While we went to school for business, our first love has and will always be ART! Therefore, we have decided to make the change to the blog’s focus and future direction (plus, it allows for much more content and avenues for posting content to keep you dear followers engaged and on-top of Indigenous Busy-ness in the West). Don’t worry, we will still be doing showcases on Indigenous businesses, as this is how we got our start, and there is still interest from entrepreneurs in being included in our blog content. With these changes, new opportunities are bound to come up, and we are so excited to announce that we are also a new Brand Ambassador for CHEEKBONE BEAUTY, which is an Indigenous owned and operated Make-up Company from the East. They have beautifully pigmented uniquely named lipsticks and products, but another great thing about the Brand is that they also give back to Indigenous Education through their profits. We will have a longer blog post about their work in Indigenous Communities and why we support this work for you in March. Stay tuned! We are having so much fun sharing social media updates for the brand and wanted to let you dear readers in on our DISCOUNT CODE! You can support this brand’s endeavours in supporting Indigenous education by making a purchase, and you can also save yourself some cash (10% off total order to be exact). How you can do this is by using our DISCOUNT CODE “CHEYM98” at check-out, or by following this link. Your purchase helps support Indigenous education, as well as the work I do in Indigenous communities, as I receive a commission from the sales collected under my code. We are so grateful for your support, as it helps us bring low-cost or free Informal Networking sessions and other relevant workshops to Indigenous communities, entrepreneurs and artists in the West (BC and Alberta). We currently have a call-out going for our first collaborative Blog, about IDENTITY, and will have some submission guidelines out to you by next week that incorporates a bit of our own story and background. We are hoping to have this blog out by end of February or early march and all submissions will receive FREE Bathbombs from the Shop, for their submission to our first call-out. You can fill out our contact form here for more details before the submission guidelines are out, or if you have an interest in telling us your story and sharing with our followers. We hope to continue to create a community for and by you, through these collaborative blogs and give-aways, so please stay tuned on our social media for these calls. Our next give-away will be an item from our first Raven Reads subscription box. Be sure to follow them on Instagram, Facebook, or order for the next quarterly box here. We are way too excited for our first box, and look forward to bringing you a vlog on our unboxing. We will also be posting a Vlog of the 2nd annual Koksilah Music Festival we attended back in September 2018 in Cowichan Territory this week to our YouTube channel (since we are going to be attending a Snotty Nose Rez Kids concert again soon and are super excited for it). We will also be doing a Summer 2018 and Fall 2018 vlog for March 2019, followed by a Winter 2019 vlog in April 2019 on our YouTube channel. As you know, I recently had the good fortune to spend a few days in Vancouver and what a trip it was! In addition to enjoying the ocean, the seas, and that fresh salt-air, I was also lucky enough to meet some locals, enjoy some great Canadian Indigenous food at Salmon n’ Bannock, and learn more about the history of the city, particularly about the Eastside. This is a bit of a longer post – but I think you will enjoy it! Sitting down with Inez, 51% owner of Salmon n’ Bannock, she told me a little background about her life and shared with me that she was adopted out of her culture at a young age (unfortunately, such stories can be common in FNMI communities, as this adopting out was once government policy and is still happening today. Here is a good article you can read on that topic, if you are interested). Through opening her business, Inez is not only breaking down cultural barriers between Indigenous and mainstream culture while blazing paths and creating opportunities for other First Nations, Métis and Inuit [FNMI] folks (her staff is all FNMI, and she even had a Blackfoot woman like me working there, from the same tribe! ), but Inez has also been revisiting her roots and reconnecting to her culture through this endeavour. This aspect is so important and very respectable especially given that she was taken away from her culture and never fully got the chance to experience it growing up. 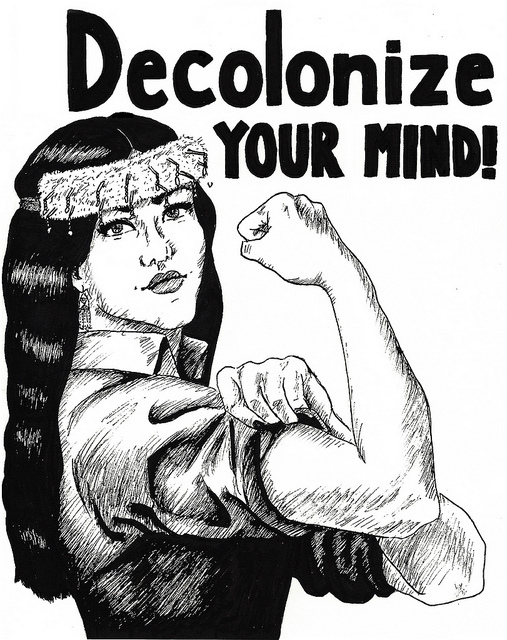 However, as Inez shows us, it is never too late to reconnect and begin to decolonize through traditional resistance and practicing our cultural ways. Not only has she created an opportunity for herself to get more in touch with her roots, she has also created opportunities for other Indigenous folks to reconnect to our food culture, as well as an opportunity for cross-cultural learning for non-Indigenous folks. Not to mention, she is giving our FNMI people within the culinary world an outlet and creating economical bases in many First Nations communities through her collaborative approach to her menu items. As someone who enjoys seeking out the traditional cuisine of visited countries, Inez was shocked that there was not such a place in one of the most bustling Canadian cities that catered towards an Indigenous menu for the original inhabitants of Turtle Island; I am so glad that her and her business partner took it upon themselves to share the diverse cuisine of our FNMI communities with the world – I’m sure her many business connections that help build the menus are as well! I really enjoyed the meal, seeing the friendly FNMI staff and people of all backgrounds and ethnicities enjoying our traditional meals, and of course, Inez’s dedication to her customers. I am very thankful for her sitting down with me and speaking to me; even though she is busy trying to manage a restaurant on the days that she is there and cater to other customers (either her or her business partner are there in body to give customers a more personalized experience, sometimes both), she still took the time to sit with me and give me her full attention, which was very refreshing. I gifted her with a small wreath of sweetgrass from my traditional territory to thank her for speaking with me (which is an important aspect when asking for favours in many FNMI communities). In addition to hanging around West Broadway, I also found myself in the East Van area a lot that weekend. I didn’t really expect to end up in East Vancouver, but maybe things happen for a reason. This area has gotten a bad rap in the public space for many reasons, some related to those reasons that are stealing some of our brothers and sisters from us. However, aside from the less than perfect reputation this side of town has, it has also been the site of many grassroots activism and you can really see the spirit of the neighbourhood in how people look out for each other there. Now I am back in Calgary, and graduation has come and gone. I’m working on getting my own business established and keeping up the blog with more frequent posts; I’ve been seeking out Aboriginal businesses here in the city this past month along my travels and actually, once you start seeking things out, isn’t it funny how many opportunities come about? It’s been a good month, and I met a lot of artists in the Calgary community, as I finally put myself out there and submitted a piece in an art show. I’m really excited to show you dear readers just how diverse the Aboriginal business world really is! Look out for my next post on FNMI art in Calgary; I’ll be showcasing a few artists that have been in the art business for various years, working with mediums such as acrylics, oils, and more traditional materials/handmade crafts like hides and other useful tools made from animal parts, as per tradition.